BATAVIA — The Clermont County Humane Society is asking for the public's help finding the person who shot a Rottweiler and left it for dead. The dog was shot on New Year's Eve and wandered, wounded, onto someone's porch. "He was in very bad shape when he first came," Clermont Animal Care Humane Society medical director Kelli Sieber said. "We weren't sure if he was hit by a car or what happened." 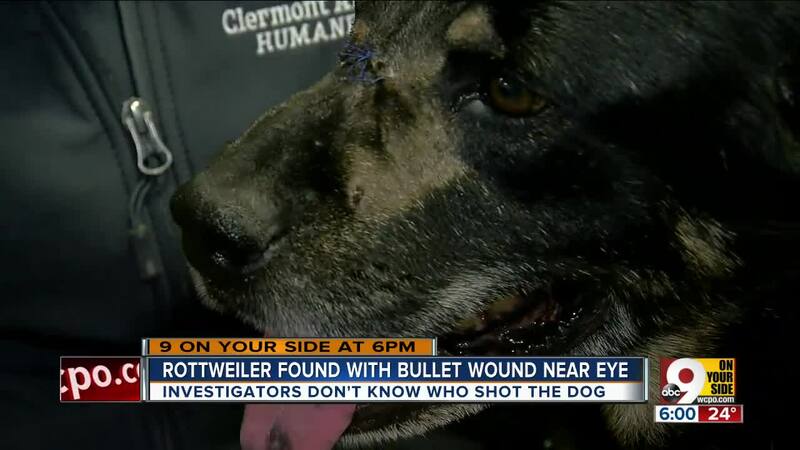 The dog was transported to MedVet, where veterinarians made a shocking discovery: A bullet wound near his eye that went right through his jaw. "I can't imagine where he'd be right now (without us)," MedVet technician Amanda Taylor said. "Luckily, we were all able to step in and help." The story of survival was shared on the Clermont County Humane Society's Facebook page, and donations for his surgeries came pouring in. So many, in fact, that rescue workers named him Midas because his story touched so many strangers. "It's devastating to think that this would ever happen to any dog, let alone a dog like Midas who's so sweet and gentle," Sieber said. "It's just shocking." Animal control launched an investigation to find the person who shot Midas.